The Justice Department announced on Thursday that seven Russian GRU intelligence officers were charged with hacking computers associated with 250 athletes and anti-doping sports organizations in the U.S.
Officials stated the hacking started in December 2014 and continued until at least May of this year. The operations intruded computers and networks worldwide.. The retaliation victimized people and organizations who exposed Russia’s illegal doping program. The expose led to Russian athletes being stripped of dozens of Olympic medals. Russian athletes were also banned from the 2016 Summer Olympics as a result. Also exposed was a conspiracy to publicize stolen information as part of a huge disinformation campaign. It was intended to undermine the efforts of international anti-doping organizations that had publicly exposed the Russian state-sponsored athlete doping program. The efforts at retaliation were intense - Russia was hugely humiliated when its doping program was revealed. Officials added there was a vile intention to damage the reputations of athletes around the world by making false claims that they were using banned or performance-enhancing drugs. 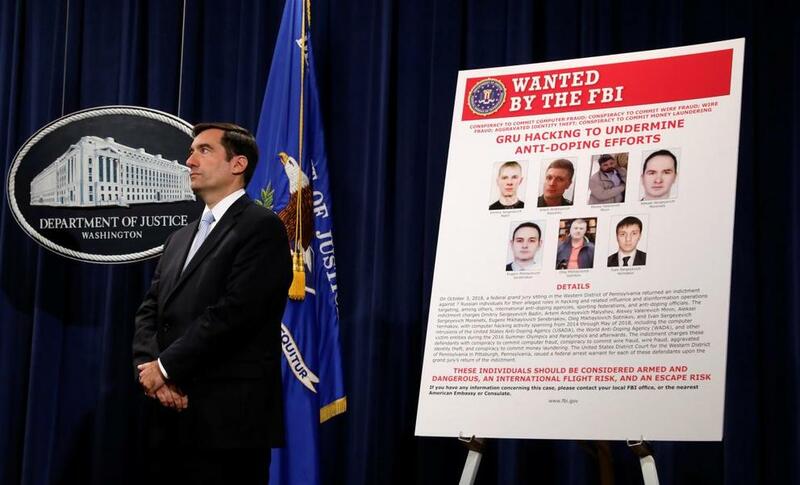 The latest charges follow indictments earlier this year against 12 Russian GRU military intelligence officers and 13 Russian nationals and businesses. Aside from the 250 athletes in 30 countries, targets included the U.S. Anti-Doping Agency headquartered in Colorado Springs, Colorado; the World Anti-Doping Agency in Montreal, Canada; the Canadian Centre for Ethics in Sports in Ottawa, Canada; the International Association of Athletes Federations in Monaco; and the Court of Arbitration for Sports in Lausanne, Switzerland. The FBI claims the group known as Fancy Bears' Hack Team targeted athletes and anti-doping officials to reveal personal health information. The officers were charged with conspiring to access computers without authorization, wire fraud and money laundering for buying computer equipment with cryptocurrencies. Five of the officers were charged with aggravated identify theft. One, Ivan Segeyevich Yermakov, 32, was charged with wire fraud for targeting Westinghouse employees for hacking through a technique called "spearfishing." The other six GRU officers charged Thursday are: Aleksei Sergeyevich Morenets, 41; Alexey Valerich Mirin, 46; Artem Andreyevich Malyshev, 30; Dmitriy Sergeyevich Badin, 27; Evgenii Mikhaylovich Serebriakov, 37; and Oleg Mikhaylovich Sotnikov, 46. Brady stressed that the U.S. is fighting back “to protect U.S. citizens and organizations from criminal cyber attacks funded by the Russian government.